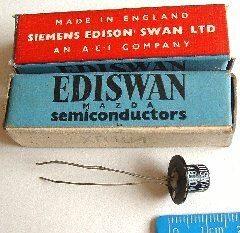 Germanium transistors branded 'Ediswan' were made by Siemens Edison Swan Ltd., another company with a long and complex history. Its roots lie in the 19th century, when the electric lighting and power distribution industry was just starting. In London in the 1880's the Siemens brothers were developing electric lighting at a factory in Woolwich. Also very active in the UK was the famous Sir Joseph Swan. In the USA Thomas Edison was prominent, but when he tried to sell products in Europe, his patents were challenged by Swan, which was resolved by a business merger that created the Edison Swan company. The further history is rather poorly documented, but apparently the Siemens business was seized by the UK government during World War I, and became a British organisation. In 1929 the Edison Swan Electric Company became the founder member of the Associated Electrical Industries (AEI) , a curious holding company that was involved with most of the UK's electrical giants. In 1953, AEI acquired Siemens Brothers. Finally, in 1957, Siemens Edison Swan was created. 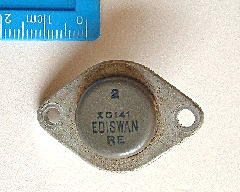 The Ediswan brand was used on germanium transistors from 1956, although my data books from 1958 onwards are printed 'Ediswan Mazda', bringing in yet another name associated with the early US electrical industry. Unfortunately, the holding company AEI had financial difficulties, caused in part by competition between its consitituent companies. In an attempt to resolve this, a restructuring and rebranding took place during 1960, in which Siemens Edison Swan Ltd became part of AEI Radio and Electronic Components Division, itself part of AEI (Woolwich) Ltd. Although the Siemens Edison Swan name was no longer used, the Ediswan Mazda branding continued to some extent. This re-organisation only exacerbated AEI's difficulties, and in 1967 AEI was absorbed into the still-expanding GEC and disappeared as a brand. Conversely, I am happy to help anyone looking for information on these devices. I have an extensive collection of original data sheets and books, and can provide some information on most Ediswan types. Technical characteristics are also available on Maurice Woodhead's excellent Vintage Radio & Electronics site. 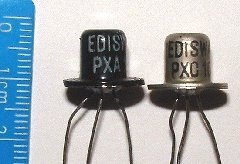 Ediswan issued five Germanium PNP junction transistors in 1956, all in a characteristic 'top hat' package. The XA101 and XA102 are described respectively as an IF amplifier and a "frequency changer and/or oscillator on the medium and long wave bands". They have a maximum collector-emitter voltage of 16 volts and a maximum power dissipation of 60 milliwatts. I have a letter dated June 1958 that gives their prices as 12/11d and 15/1d respectively. I remember that as a teenager I built a "Roamer 2" transistor radio kit that used these Ediswan transistors, although I think that they were unmarked. I bought the kit from an advertisement in "Practical Electronics" magazine. The circuit was hand-soldered along a tag board. It did work, but not very well. The XB102 and XB103 from 1956 (there never was an XB101, why not?) are AF amplifier types, with a maximum collector-emitter voltage of 35 volts and a maximum power dissipation of 90 milliwatts, and a gain range of 18-47 and 40-105 respectively. The June 1958 letter gives their prices as 8/5d and 9/6d respectively. The XC101 from 1956 is an AF output type, with a maximum collector-emitter voltage of 35 volts and a maximum power dissipation of 100 milliwatts. Uniquely amongst Ediswan's top hat transistor types, it is unpainted. The 'C' in the part number apparently designates 'power output', although the XC101 is relatively restrained in its capability. The June 1958 letter gives its price as 11/1d. 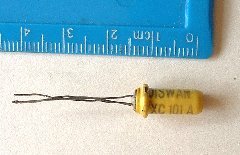 The XS101 from 1958 is a symmetrical transistor for switching circuits and modulators. 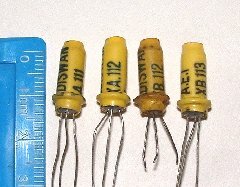 A number of early manufacturers made symmetrical transistors, in which the collector and emitter were functionally interchangeable. This was believed to be advantageous for some circuits, but the concept did not last very long. The XS101 has a maximum collector-emitter voltage of 12 volts, a maximum power dissipation of 90 milliwatts, and a common-base cut-off frequency of 2.5 MegaHertz. The June 1958 letter gives its price as 22/6d, by far the highest price of the six transistors first announced by Ediswan. In July 1958 Ediswan announced the XB104, a general-purpose AF type. It has a maximum collector-emitter voltage of 16 volts, a maximum power dissipation of 60 milliwatts, and a gain range of 18-47. It appears to be a lower-specification version of the XB102. The image shows the Ediswan box in which the transistors were supplied. By the end of 1958 Ediswan were offering an 'alternative range' which comprised functional equivalents of all the seven above tranisistors but in a different package, a metal 'cigar tube' shape enclosed in a plastic insulating sleeve. Their type numbers differed from the originals in using the number '11n' rather than '10n'. My image shows the ones that I possess: the XA111, XA112, XB112 and XB113. Incidentally, the Siemens Ediswan Swan Journal number 3 volume 1, dated "Autumn 1959", shows on the cover a number of what are apparently prototype transistors in the alternative construction with plastic sleeves in a complete rainbow of colours. I have only ever found examples in yellow or pink. with the one exception shown on the right: a purple XB113. 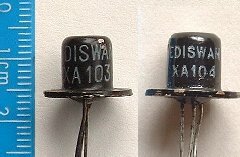 In 1959 Ediswan issued the XA103 and XA104, described as being functionally the same as XA101 and XA102 but for use "where the closer parameter control of the XA101 or XA102 is not required". The data sheets show that these types have lower maximum voltage (12 volts collector-emitter) and higher leakage currents. They were probably an attempt to market out-of-spec examples of XA101 and XA102. I have Ediswan tentative data sheets dated December 1959 for the series XA121 to XA126, germanium junction drift transistors for IF and RF applications. The spec shows what looks like a TO-7 encapsulation. 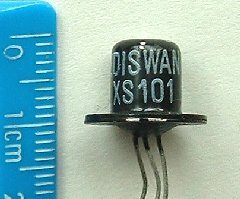 It is relatively common to find Ediswan transistors of any X---- type prefixed by the character 'P'. 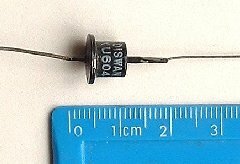 This signifies 'package', and these transistors were supplied as part of a package of several types intended for a particular application. For example, the LF6 package of transistors consisted of a P.XB113 driver stage transistor and a matched pair of P.XC171 output transistors supplied in a holder which was designed to give a low thermal resistance when mounted on a heat sink. It is also a characteristic of early Ediswan types that the leads become quite corroded and brittle, and are often broken off short, frequently just under the can itself. This image shows a very rare device, or rather, a pair of devices. 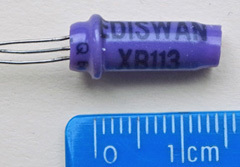 This XC131 is a pair of Ediswan XC-type output transistors in a common heatsink. The prefix 'P' confirms that they were sold in a 'package', probably with an AF amplifier and an AF driver. 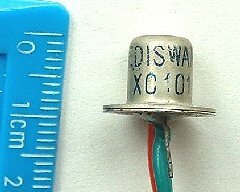 Ediswan did make some power transistors. 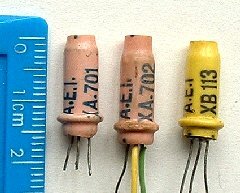 By the end of 1959 they had announced the XC141, XC142, XC155 and XC156, all germanium PNP audio types. Sadly from the point of view of the vintage transistor enthusiast, they used the standard TO-3 'diamond' construction, rather than inventing another idiosyncratic British encapsulation. The XC141 shown is a 40 Volt Vce device capable of 3 Amps peak current. The XC142 is a 60 Volt version, and the XC155 and XC156 go to 80V and 100V, and even higher currents. Then in late 1960 they announced the XC703 in a VASCA SO-3 can, the XC713 in a TO-8 construction, and the XC723 in a TO-3 can, all silicon NPN diffused junction power output devices. 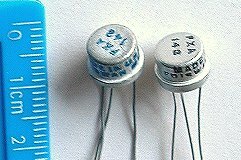 In late 1959 this pair of germanium PNP junction switching transistors came out. They have a Vce max of 16 Volts and a power dissipation of 66 milliWatts. They differed in gain, the XA151 having a minimum static current amplification of 80 and a gain-bandwidth product of 3 MHz, the XA152 had a minimum static current amplification of 40 and a gain-bandwidth product of 5.5 MHz. In 1960 Ediswan issued more switching transistors, this time germanium NPN junction types in a groovy pink-sleeved version of the alternative construction. The XA701 has a Vce max of 24 V, Ic max of 200 mA and a typical pulse rise time of 0.35 uS. The XA702 has a lower Vce max of 15 V but a higher Ic max of 400 mA and an improved rise time of 0.25 uS. The XA703 has an even lower Vce max of 12 V, an Ic max of 400 mA, and a minimum common-base cut-off frequency of 10 MHz. There are other Ediswan types made in USA, all with the prefix 'F', but in a TO9-like encapsulation. These XA142 and XA143 are germanium PNP drift transistors for high-speed switching applications. They come in the small Ediswan boxes shown above for the XB104, which are marked "MADE IN ENGLAND" despite the contradiction printed on the transistors themselves! 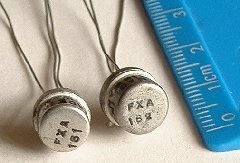 The XA161 and XA162 from late 1959, again with the prefix 'F', are described as germanium PNP mesa transistors for use as a high-speed switch. The two types are 12 V 100 mA devices that differ in their gain-bandwidth product: 40 MHz for the XA161 and 60 MHz for the XA162. The two shown in the image are very slightly different physical sizes. The XU604 on the left is a silicon PN junction diode intended as a power rectifier. It has a peak inverse voltage of 400 Volts and a maximum mean forward current of 500 mA when maintained at below 75 degrees Celsius, presumably by a heatsink. 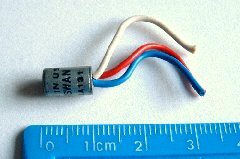 The type XD901 is a germanium varicap diode used for automatic frequency control. I am seeking examples of this device. A few Ediswan types can be found branded AEI. Presumably these post-date the 1960 re-organisation of AEI that ended the the Siemens Edison Swan company. However, data sheets from after that year still have Ediswan Mazda branding, so it is not clear to me exactly why AEI was used on some devices. 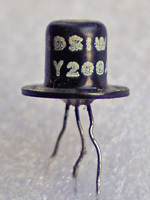 Here is an Ediswan transistor in their typical black-painted 'top hat' encapsulation, marked Y208A. This is not part of their standard series and I have no idea what this was used in. 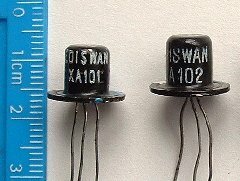 Here are another two transistors in the black-painted 'top hat' encapsulation that is unique to early Ediswan devices, but marked AEI TR1A and TR2A. 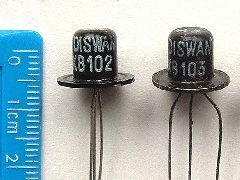 Ediswan fell under the AEI umbrella, but why did AEI brand these two transistor types as their own? I am grateful to John Hills of Oregon in the USA who has explained that these TR1A and TR2A transistors were supplied to Tri-ang (Lines Bros) for use in their Tri-onic kit sets. These sets were probably only produced for a few years from 1961 until 1963. John's 1961 "A" set contains two top hat transistors marked "A.E.I. TR1A" and "A.E.I. TR2A", exactly like mine. These kits contained components in plastic housings with connecting pins that plugged into a series of circuit boards, Tri-ang designated the "A" set transistors as TR4 and TR5. TR4 is the TR1A and is described as being the RF transistor, which John believes to be an Ediswan XA101 or XA102. TR5 is the TR2A and is described as being the AF transistor, which John thinks may be an Ediswan XB102, XB103 or possibly XB104. John has other Tri-onic kits and some have transistors marked "A.E.I. TR1" and "TR2" but in metal cans with plastic sleeves that are probably later Ediswan types. 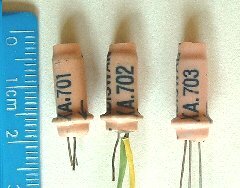 Even later kits contain Mullard OC series transistors. In 1962 Tri-ang introduced the kit "A/B", This added five more printed circuits and other components including another RF transistor in the TO7 package, probably a Mullard AF11X type.